When they straightened Dufferin, they created what is probably Toronto’s shortest bike lane. Riding downhill toward Queen, it took less than 1/2 a minute to go the full length of the lane. But who’s complaining, at least someone in the city planning department remembered bikes. Then the TTC decided to shift the bus stop from the south to the north side of Queen. Now the buses have no choice but to block the lane. The shortest bike lane just got shorter. 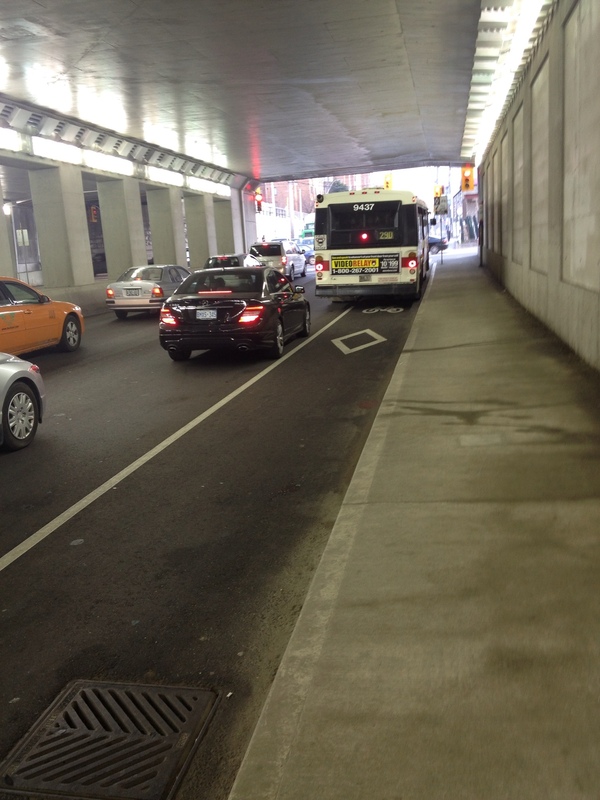 This entry was posted on Tuesday, April 10th, 2012 at 9:44 pm	and tagged with bus stop, shortest bike lane, toronto, TTC and posted in Uncategorized. You can follow any responses to this entry through the RSS 2.0 feed.